The MA program in economics is designed to train students in the quantitative and applied economic skills that will best enhance their future employment opportunities in the private and public sectors, or their pursuit of PhD studies in economics or related fields. Our MA program emphasizes extensive training in mathematical and quantitative analysis, including the provision of substantial exposure to econometrics and forecasting, working with large and diverse data sets, and a wide range of statistical software. This gives students the applied skills that employers demand, provides those pursuing advanced degrees an edge in gaining admission to top-flight PhD programs—and enhances the likelihood of the student's ultimate success. Evidence of our success in this area can be seen in part through the placements of our students. In recent years, a number of our graduates have gone on to top-ranked PhD programs including Harvard, Stanford, UC-San Diego, Illinois, Michigan State and University of North Carolina. Others have gone to work as economists in various federal, state and local government offices. Most of our graduates move into the private sector, working as economists or quantitative analysts for local, national and multinational corporations. The program offers a great deal of flexibility to meet each student's career goals. The M.A. in Economics can be completed in as few as three semesters by students who begin the program in the fall, although students who are working full time typically take four or five semesters to complete the program. The dual-degree programs requires a minimum of five semesters. All of our M.A. core courses, and most electives, are offered at 5:00 p.m. or later on either a Monday/Wednesday or Tuesday/Thursday schedule. Financial aid is handled through the University’s financial aid office. You can find more information here. The department of economics offers some financial assistance in form of Teaching Assistantships (TAs), Research Assistantships (RAs), and graders. 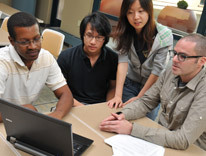 These positions are typically awarded to students after their first semester in the program, but incoming students, including international students, are allowed to apply after they have been admitted to the program. In addition, the department offers a limited number of partial tuition scholarships. Recipients of this award are hired by the Department of Economics to work as a TAs, RAs, or graders. In addition to their regular pay, recipients will receive a Tuition Scholarship Award that pays some of the tuition costs for graduate level economics courses taken at UC Denver. Students may apply for this award after being admitted to the MA program. 1The "Seminar in Applied Economics" (ECON 6053, 6054) are 8-week 1.5 credit modules, two of which are offered each semester. These courses expose students to economic literature employing quantitative analysis within the fields being covered in the modules. Modules will include, for example, labor economics, public finance, monetary economics, and economic development. The students will be required to take two of these 8-week modules as part of the core; up to two additional modules can be taken for elective credit. 2The "Research Seminar" (ECON 6073) allows the student to undertake independent empirical research project under the guidance of department professors, who serve as mentors. This seminar replaces the traditional Masters thesis option and is intended to guide students through the process of conducting independent research and preparing a Masters paper.